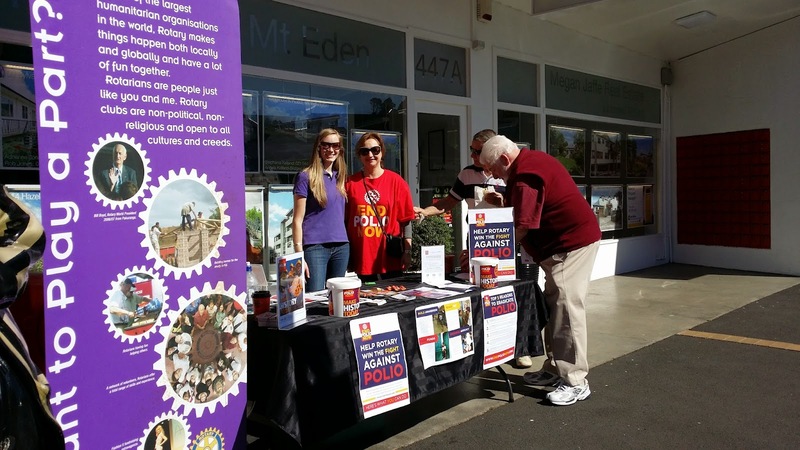 The Rotary Club of Mount Eden have made a conscious effort this year to help raise funds towards the eradication of Polio. It has also had a busy time with holding three fundraising events in less than four weeks. The first event the club held was a bucket collection day on the 25th October in Mount Eden Village. Over $100 was raised, and the event also helped raise awareness of Rotary’s activities and of the Mt Eden Club. The second event held was a movie night on the 13th November. It was a great night with over 100 tickets sold. The club raised a total of $1074.06. over $1,000. The funds raised from these events will be donated to Rotary International’s EndPolio campaign. As the Club’s President, Penny Jorgensen, told the movie audience, the funds will be tripled thanks to the 2-to-1 match by the Bill and Melinda Gates Foundation, and could help vaccinate up to 3,000 children. The third event held was a sausage sizzle on the 23rd November outside Bunnings in Mount Roskill. The Club was offered the fundraising opportunity at very short (less than a week’s) notice. “It was wonderful how members rallied to make this a success” said Penny.